Viewtek Indoor Amplifier HDTV Antennas 60 Miles is specially designed for receiving digital over-the-air(OTA)TV broadcasts from local television stations and can pull in all of your local news,weather,sitcom,kids and sports programming with no monthly contract or bills.Enjoy crystal clear HDTV shows,720P,1080i, 1080p,4K|ATSC.Just plug it into your television and let the TV antenna do all the work. TV Antenna isn't just an antenna-it's a passport to freedom.Your cable company doesn't want you to know this but u can still get lots of channels right over the air and for free. The number of channels you get is determined by what's being broadcast in your area,how far away you are from the towers,and your surroundings.We do offer a 40-day money back guarantee in order for you to test the suitability in your area(conditions apply). 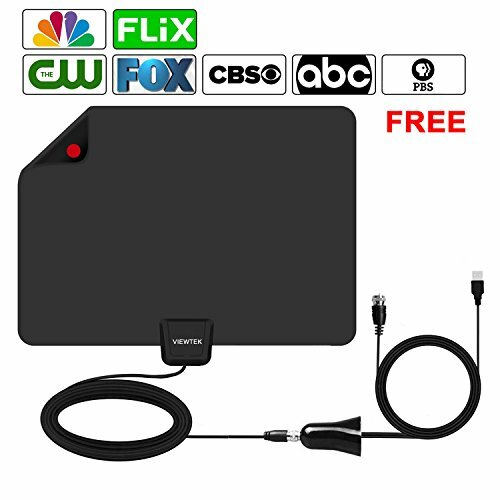 FULL FREE HD CHANNELS-- Cut monthly cable and get access to local news, weather, sitcoms, kids and sports, educational programs etc., The 60+mile HDTV Antenna lets you enjoy over-the-air networks in your area without paying a monthly fee. HD CRYSTAL CLEAR TV SHOW-- Please first visit "antennaweb.org" or "antennapoint.com" to check how many broadcast towers surrounding you within 60+ miles. Enjoy crystal clear HDTV shows, 720p, 1080i, 1080p,4K | ATSC available. Digital TV antenna pulls in hundreds of crystal clear digital & HD shows! Receives free HD channels including ABC, CBS, NBC, PBS, Fox, Univision and more. Detachable Amplifier & 13ft Coaxial Cable Included - Use the amplifier for the full 60+ mile range, or remove it for better reception of live near to TV broadcast tower. With extra long 13.5ft coaxial cable, you can place the hdtv antenna where the signal is the strongest. Makes indoor tv antenna easier to get the best reception, especially for customers whose televisions are quite far away from windows. 100% Guarantee: 12 month warranty; 40-day unconditional return; Simply contact us if you have issues with our antenna.